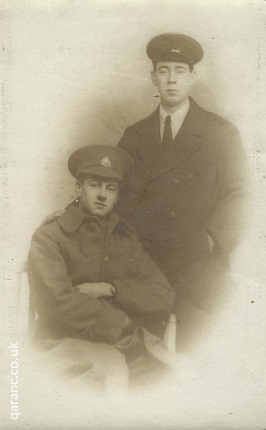 In this photograph is two brothers who both served in the First World War. On the left is Sydney Claude Stroud who served in the London Regiment and on the right is his sibling Frank Stroud who served in the Royal Flying Corps. Both survived the Great War, though Sydney was wounded during the Battle of the Somme in October 1916. 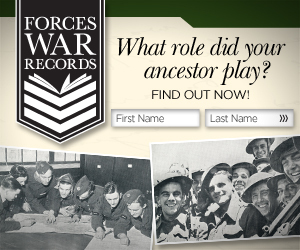 He was shot in the groin and was evacuated back to Britain and treated at Royal Victoria Military Hospital Netley. On the reverse of the postcard there is space for a written message and the address of the recipient. 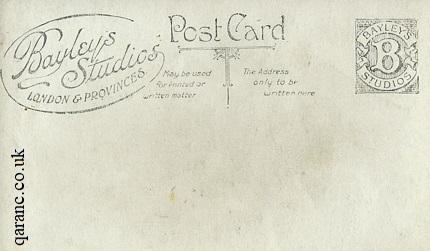 In this section is the Bayleys Studios London & Provinces stamp. Operating Theatre RV Hospital Netley Postcard. Photo Postcard Royal Victoria Netley Patients and Staff. RV Hospital Netley From Southampton Waters Postcard. Walking Wounded Soldier Patient Netley Army Hospital World War One.